A cousin of mine has two Siamese cats. In March I went to lunch with her and she told me a story. She'd been house-sitting for a friend (with her cats along for the ride) and in preparation for an evening out she'd pressed some clothes, hanging them up before going off to finish a few other chores. She thought the clothes were out of the cats' reach, but when she returned a while later, she found that her top, a beautiful wool cardigan, was full of holes. Chewed. To. Pieces. One of her cats is a die-hard wool-chewer. Our opening headline was chosen to reflect the 'Cat Who' book titles by Lilian Jackson Braun, many of which are very funny, but wool-chewing (and the chewing of other inedible materials) isn't funny at all. 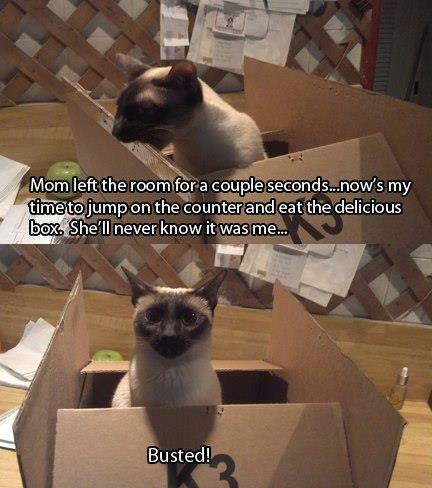 Some cats, and Siamese cats in particular, seem to make a habit of chewing things that aren't good for them. Wool, cotton, other fabrics, cardboard, plastics, bubble wrap, cables, phone chargers, and all sorts of other items that you don't particularly want chewed seem to fall victim to cats who chew. I've read a statistic that of cats with this disorder, over 50% of them are Siamese. And this is a disorder. More properly known as pica, the chewing of indigestible objects can be extremely dangerous.
" I have a problem that I am hoping others might have some ideas for. My one-year-old seal point is constantly chewing THROUGH electrical cords. My big concern is the possibility of her being electrocuted. I have tried putting the bitter/yuck spray on cords and she just licks it off like it tastes yummy. Any thoughts? I'm desperate! " So yes, it's a dangerous habit. There are some who say that pica occurs when kittens are separated too early from their mothers, and this may be one cause, but pica is also found in cats who spent the normal length of time (around 13 weeks, for Siamese cats) with their moms. Other possible causes are genetic inheritance (pica sometimes runs in cat families) a cat's emotional make-up, and difficulty coping with stress. If you have a cat that likes to chew, the No. 1 best thing you can do is to make sure that whatever substance they're chewing isn't accessible to them at all by removing all wool, fabric, plastic, etc. from out of their reach and cat-proofing your environment as much as possible. This isn't always easy though, as my poor cousin found. Some cats are prone to chewing furniture (leather seems to be a particular favorite), others love electrical cables, and these are both items which may need to stay where they are and not be moved. With items like this that are difficult to hide away, you could try the 'bitter/yuck spray' mentioned by Mindy, better known as Grannick's Bitter Apple Spray for Cats . Some people have found this very effective, while others say that it doesn't work at all for their cat. Note: While this is specifically marketed as a product for cats (and therefore presumably safe) I haven't tried it myself, and I would always check with a vet first before using this or anything like it. I've also read that lemon juice can be an effective deterrent. Cats are known to dislike the smell of lemons and this may help, so for larger items like furniture, you could make up a solution of lemon juice and water in a spray bottle, or alternatively rub the outside of the skins (the oily side) over whatever it is you're trying to protect. Cats evolved to get their nutrients from tearing and chewing their food and commercial cat food doesn't offer much in the way of chewing opportunities, nor does it necessarily always provide all the nutrients your cat needs. There is a school of thought that pica may arise from these needs so another solution to the chewing problem may be to provide your cats with the kind of thing they'd chew on in the wild - namely, raw bones. Try giving your cat a raw chicken wing (NOT a cooked one because cooked bones splinter) to chew on, and see if this helps. Some cats won't go near raw food, others love it and it may just be the thing your cat needs. Electrocution is a very real danger for cats who chew flexes and cables and sadly I've actually heard of this happening to at least one poor cat. Some do-it-yourself solutions are to try wrapping the cables in foil (some cats don't like the feel of this in their mouths) or to coat the cable with orange or lemon oil, with other suggestions being mustard and Tabasco. mostly hidden anyway, and it worked." Thanks Lois, that's a good solution, and I'm glad it worked for you. 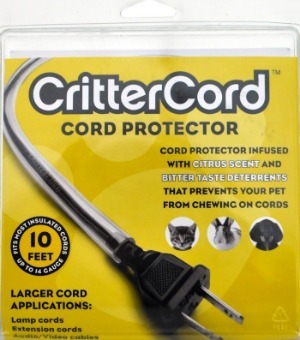 For a more permanent and heavyweight solution, you could try some form of cable cover including CritterCord Cord Protector which is specially formulated to protect cords from animals. Another extremely effective covering is American Terminal 1/2-Inch Split Loom Tubing . 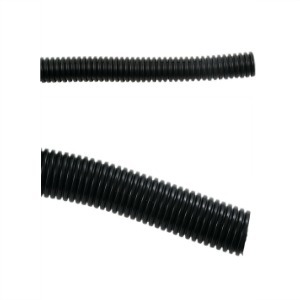 Both these are available from Amazon - the Split Loom Tubing in particular has great reviews from cat and rabbit owners and is thick enough that your cats won't be able to chew through it. (If you have several cables to cover, you might want to try the wider one-inch version ). As always, I'd be delighted to hear from anyone who's tried any other ways of deterring your cat from chewing your household items, especially if you have a solution you think might work for others. You can reach us through the Contact page if you'd like to share any of your own tips. "I adopted Finley as a kitten from Last Chance Animal Rescue and he is the most wonderful Snowshoe. He quickly became best friends with my other rescue, Sawyer, and is such a smart, loving boy. He also loves the camera and seems to know how to pose." He certainly does, Rhonda! Thank you so much for sharing Finley with us. 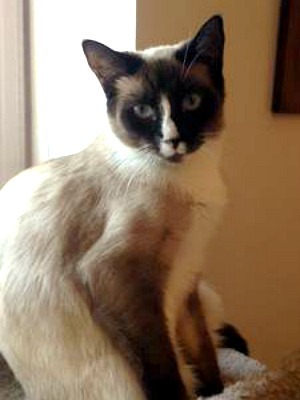 We have a new story on the site from LizEllen in Kentucky about her cats through the ages, and in particular her current Siamese cat Winger. Do pop across and read 'Kitties of Time'. 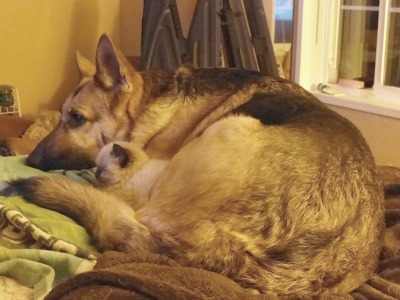 A popular image this month on our Facebook page was this, shared by reader Brenda of her rescued and adopted kitten snuggling up to Brenda's work partner, German Shepherd Miss Shasta. An adorable image in itself, people also loved the kitten's name, Tonka Fluffy Pants! We'll be back at the end of May. Have a great month meanwhile.